We rarely, if ever write articles about earthquake swarms at the Tjörnes Fracture Zone. The reason for that is glaringly obvious, those swarms are incredibly common. Pretty much, a day without fairly intense activity is a rare beast indeed. So, this is a bit outside of the ordinary programming. The area is one of the least studied in Iceland from a volcanic standpoint, but the general dynamics of the faultlines in the area is well known. So, let us start there. Tjörnes Fracture Zone, image from Jakobsdottir 2002; Thorbjarnardottir & Gudmundsson 2003; Thorbjarnardottir 2003. It is no secret that the Mid Atlantic Rift (MAR) is running through Iceland. In southern to mid Iceland it is running through several different faultlines, this is though of no consequence for this article. But, from the triple-junction volcano of Bárdarbunga the MAR is running in a uniform line northwards through Iceland to Theistareykjarbunga, via Katla, Fremri-Namur, Heidarspordar and Krafla. All rifting of the MAR in this area occur along the NNE-trending fissure swarms of these central volcanoes. At Theistareykjarbunga things start to become interesting again. It is yet another triple-junction volcano. Just south of the volcano you have the WNW-trending Dalvik Line, an older more sedate major faultline that seems to be declining in activity compared to its two other compatriots. Or, it may be locked and could be re-opened in the future in a larger seismic event. No large earthquake swarms are known on this fault. Directly from Theistareykjarbunga the Husavik-Flatöy Fault runs towards WNW. It is a strike-slip with dextral spread faulting, which is a fancy way of saying that the edges of the continents are both grinding against each other as they slip by each other, and that the fault is also spreading apart. The third faultline is the Grimsey lineament, and it is here that things start to become interesting, both from a seismic standpoint and a volcanic one. The fissure swarm of Theistareykjarbunga continues out into the waters of Öxarfjördur where we find a volcano that is unnamed. I usually call it Öxar from the water it resides in. Almost nothing is known about this volcano, but it is believed to have been active in the Holocene. It is from Öxar that the Grimsey lineament takes off on a WNW line running north of Grimsey proper until it joins the Kolbeinsey Ridge. Unlike the Husavik-Flatöy Fault the Grimsey Lineament is not a true strike-slip fault, instead it is a fracture zone where the spreading occurs in discrete N-fracture swarms. The fractures are either created through large earthquakes ranging up towards M7, or through intense earthquake swarms. East and North of Grimsey you find two more unnamed volcanoes, the one to the east and northeast I call Skjalfandi, and the one to the northwest I call Grimsey. The one we must contend with today is Skjalfandi. Overlay map of the area showing volcanic features with the earthquakes during the stated week. Overlay by Beardy Gaz, earthquake map from IMO and bathymetric map from S.Magnúsdóttir, et al (2015). A little more than two weeks ago an earthquake swarm started at Skjalfandi volcano. During the first ten days it was a pretty ordinary sequence of earthquakes for the area consisting of tectonic earthquakes. The swarm during this period produced episodes lasting from hours of seismic activity up to a day or so with calmer interludes. 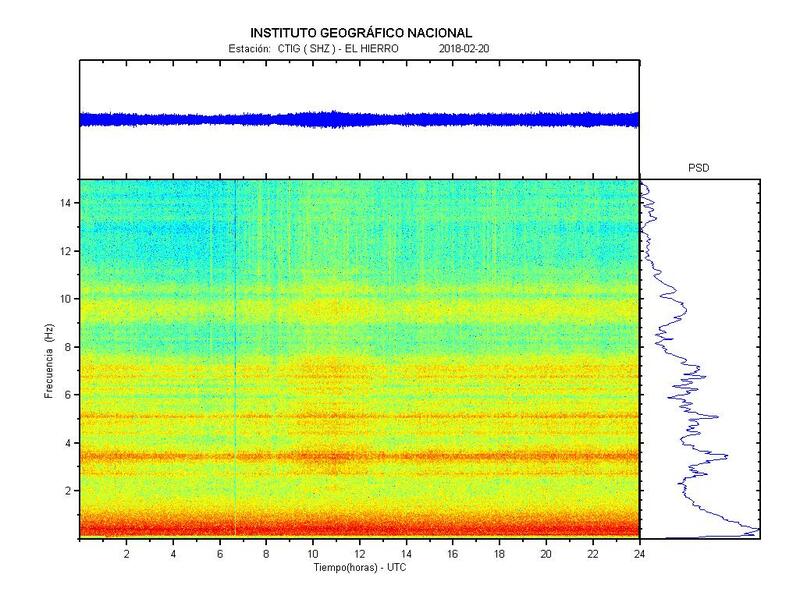 During this period, we saw a select few earthquakes just above M3 in strength. At the same time a couple of weak signals was detected that could be interpreted as hydrothermal activity, but that is not something out of the ordinary since Skjalfandi is intensively hydrothermally active to begin with. M3 sideways. Do not that the depth is upside down. Image by Andrej Flis. Skjalfandi volcano itself is either a large subsidence graben due to spreading, or a large subsidence caldera. Both what little literature there is about the volcano, and the general geometry, is unclear on this part. Probably it is a little bit of both, so one could call it a grabera just to annoy people. M3 top down and from NE-SW perpendicular to the fault orientation whish is NW-SE. Image by Andrej Flis. It is a sizeable volcano with lots of parasitic vents and cones littering the ocean floor, especially on the north-west side. The caldera (it is easier to call it that instead of a grabera) floor is intensely hydrothermally active, with water-temperatures of up to 160 degrees. The caldera sediment has been transformed from volcanoclasts into kaolinite and smegmatite and ranges from slightly alkaline to acidic. This transformation has occurred due to the hydrothermal activity. The sheer volume of hydrothermal activity indicate that this volcano has been repeatedly active during the Holocene, even though no historical eruption is known to have occurred. About five days ago the earthquake swarm intensified quite a bit after an earthquake of M4.1 happened. Both the number of earthquakes, and their relative strength increased significantly. So far, this swarm is the strongest recorded since the run-up to the Bárdarbunga eruption. The strength of the largest earthquakes is comparable, but the numbers of earthquakes appear to be less, but the numbers are lying a bit. With the M2 earthquakes things become a bit clearer. Image by Andrej Flis. The network covering Skjalfandi is not able to reliably pick up earthquakes below M1, so all those small earthquakes are lost to the monitoring network. If the network could have picked them up, we would see roughly the same numbers as we did at Bardarbunga in 2014. M2 top down and from NE-SW, perpendicular to the fault orientation which is NW-SE. Image by Andrej Flis. It is here good to remember that the earthquakes are hard to locate here, the stronger the better the positioning is. Even the M2.0 to M2.9 earthquakes are not perfectly located. But, with the number of M3+ earthquakes we have at hand we can still get a good picture of things. 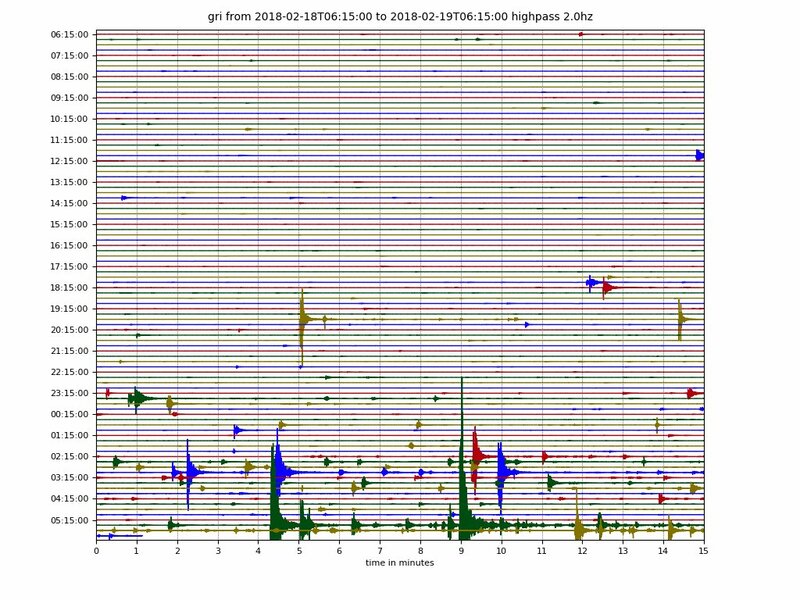 Up until Saturday all of them occurred between 11 to 15 kilometres depth, but on Saturday we started to see a sprinkle of shallower M3+ earthquakes ranging all the way up to 4.5 kilometres depth. This means that the main activity was located just above the mantle/crust-boundary, and that the activity now has started to move upwards. Individual bottoms up sheet dykes. Image by Andrej Flis. Another thing that we can see on our plots are that there are 3 discrete fractures operating that have formed three individual sheet dykes running at an angle upwards. I should here point out that no volcanic signals have been detected, but when we see these dyke-like formations occurring in Iceland magma is rarely far behind if the seismic activity is running long enough. These dyke formations occur quite often without causing any eruption, it is just magma filling in deep ruptures in the crust as Iceland is being pulled apart. Another interesting thing is that the seismic activity has spread across the length of the fault system all the way from Theistareykjarbunga all the way up to and beyond the Kolbeinsey Ridge. What I find intriguing here is the patterns and shapes that these dykes form, and that there are three of them forming at the same time. To me this looks more like the start of a rifting episode than anything else. So, if this continues for a longer period and an eruption occurs we might see a strange thing indeed since the depth is not that great. We might see Skjalfandi go from a caldera to Skjalfandey in front of our eyes. Or, perhaps that is just me wishing for a tad too much. Another thing that I find intriguing is that the GPS at Grimsey is not picking up a lot of movement. During this activity the station has moved 7 millimetres to the southwest and about 10 millimetres down. That is not a lot of movement for neither an intrusion, or a seismic event on this scale. I think one reason that we do not see more motion is that so far, the bulk of the larger earthquakes have been comparatively deep, and that the movement will pick up if the earthquake activity centre keep on moving up. Great read and to celebrate the swarm just produced a M3.9 quake at 1.1km depth(not manually checked yet). With this being a rifting episode, or it could become one, is it possible that this could be prolonged like from 1974-1985 at krafla? Theres lots of small cones there which might be from this effect. Also a rifting event through theystareykjarbunga might do something after the inflation there earlier this decade? Also is grimsey a holocene volcanic vent of this volcano? “in a uniform line northwards through Iceland to theistareykjarbunga, via katla, fremri-namur, heidarspordar and krafla” Is there a typo where ‘katla’ is supposed to be askja? It could very well become a Krafla style rifting episode lasting for years. This is not on Theistareykjarbunga fissure swarm, and there is nothing indicating that Theistareykjarbunga is involved in the activity. Grimsey is not a associated with this volcano, Grimsey is the remnants of an old volcano. What’s the ocean depth in that area? From 100 fathoms and below. 100 fathoms is apparently about 180 meters, which is not much deeper than the ocean where surtsey is now before the eruptions there and I have read that surtsey reached the surface quickly after the eruption started. So maybe a large event might actually create a new island if it lasts long enough or several eruptions from roughly the same place occur. Most of the writers here are EU or nearby based. Assuming C is appropriate, unless angular measure is intended. Personally, I’ll indicate F if that’s what I mean. Even in the US, scientists use the metric system. Big blast at sinabung today – perhaps its largest yet. Current VAAC has the plume at FL550. If I were taking that video, I think I would be wetting myself. Distance must a be a lot further than it looks. Thanks for finding it! Í really loved this article but I’m kinda scratching my head as to what you mean by unnamed volcanoes… The IMO map(s) you provided show the outline of 4 volcanic system, Stóragrunn and Hóllinn are NW of Grímsey, Nafir is East and NE of Grímsey and includes the Skjálfandadjúp basin, and then there are Mánareyjar just off Öxarfjörður. Could you please clarify the location those the unnamed volcanoes in relation to the ones the IMO map? Problem here is that only Storagrunn is the name of the volcano. Nafir is a seamount and not the actual volcano. And Mannareyar and Hollinn are names of fishing shoals. IAVCEI has all of them as unnamed except Storagrunn. And none of them are on the canonical Icelandic list except Storagrunn. So, I will go with unnamed for them. Skjalfandi is though Skjalfandi since it is the name of the caldera floor. So just vents of the TFZ volcano, as Holuhraun is to Bardarbunga. Thanks Carl. This was just in time. Will be exciting to see what follows! At the moment it seems like more magnitude 4 earthquakes. Question for the plotters and mathematicians; what would be the single-quake equivalent magnitude of all the M3+ quakes added together in the swarm so far? It takes 30 M3’s to make an M4. The ~100 M3’s so far would have made an M4.5 or so (very roughly). The M5 has liberated most of the energy so far. There was enough pent-up stress in the area for an M6-M7, so there could be more to come. Although the risk for an M7 is probably higher on the HFF fault closer to the Iceland coast. The M5.2 is roughly equivalent to the rest of the swarm, so around M5.5 in combined energy for the swarm. Indeed, reports today of a shark having fallen from the UK and landed in a garden. I don’t really want to link to the kind of newspapers that reported this! Clearly linked to Iceland. There may have been magma movement this morning. The lowest tremor level rose from a baseline of 3500 units to 5000 units for 2 hours as the largest earthquakes struck, after that it declined. The tremor was broad spectrum ranging from 0.1Hz to 20Hz during this period. It could also have been a phreatic event, but it is impossible to tell since it is not possible for me to locate the tremor well enough. I do favour the magma movement interpretation since it coincides with deeper earthquakes. That was a big one. Thanks for the article Carl. What could be the visible signs on the onset of an eruption at this place? Pumice and discolored water, or something more spectacular? After that discoloured water, and if it is shallow enough we would quickly get rostertails and other Surtseyan activity, since Iceland does not do small eruptions like El Hierro. I made an animation of the progression of quakes. To me it looks like there is one active quake plane at a time and then the activity jumps to another plane as the strain release propagates. To me it looks a lot like the bookshelf tectonics of the SISZ, with the quake planes perpendicular to the general movement of the plates. Personally, I think it is more likely that this will lead to one of those really large earthquakes, rather than a large eruption. Time will tell. Well I dont think theres a lot of data on what happens when a magnitude 7+ earthquake happens on a rift zone near a number of volcanoes which are recently active or progressing to an eruption in the future (krafla and theystareykjarbunga). In 1910 Iceland was relatively quiet and the northern volcanic zone was basically dormant but now it is different and an earthquake that big could have long term effects further south. A really large earthquake on the Grimsey Lineament is a bit unlikely since it has been releasing pent up strain well for as long as we know. Also the fractures there are to short. A large earthquake would be more likely on the Husavik-Flatöy Fault, but that has also been historically active after the last large earthquake there. 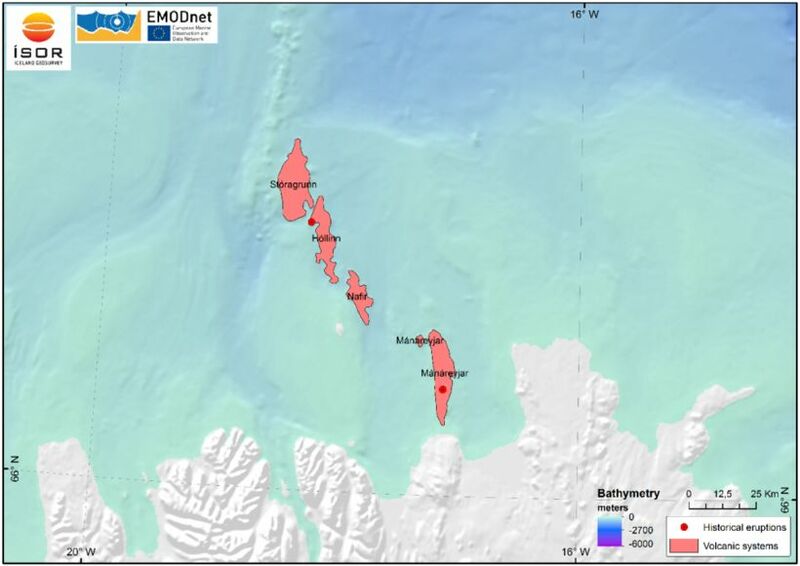 A large earthquake is more likely either on the Dalvik Lineament or out in the Kolbeinsey Ridge. The nightmare option is a large one at Theistareykir itself, it is fairly locked down right now, and we do know that it can cause large earthquakes about once every 100 years. I should also say that there have been magmatic codas on the last bunch of large earthquakes. I will upload a picture of it. Really nice plot! Very informative! And now that IMO has dropped the classic stonetablet, this is why they did so. You can look at the coda on the picture below. It is clearest on low-frequency, but it goes for all frequencies. This is a sign that magma is moving into the new fractures. There was also a tremor episode earlier lasting for two hours. Well, I read the uncertainty level declaration more as a warning for potentially larger earthquakes than a warning for potential eruption. It is a bit of both. Is it possible to have an eruption and a large quake or just one or the other? All of abowe, Gos (not Gós, thats for Swedish Trolls only) and Grímsey and Mánáreyjar (these are actual islands and remants of volcanoes) sink. Like a stone tablet would.. Then some obsolete Hollywood director steps in and memes it with a movie, sequel eve, starring that actress always falling at Oscar but can shoot with bow & arrows.. I will arrange for scenic tour in an single seat non-flyable biplane from that old nearby closed airfield, at night and in fog or this what happens when … ash falls? Will provide surgical masks. Seriously, this episode can be felt at times on other side. Note: Not Swedish, just a redneck quoting a Swede. Large earthquakes here are infrequent but not non-existant. Most have been on the HFF, and they reach M7. However, there has been little since 150 years or so and the area is due for a large one. On the Grimsey rift, the main events were in 1976 (southeast end, related to the start of Krafla) and 1910 (M7, centre of the rift). The northwest end, where the current swarms are, there are no historical records of a big event but of course, that just means it hasn’t happened since modern instrumentation. It is possible that the swarms release all the stress that builds up. (The central region, where the 1910 quake happened, has no swarms. ) However, the way that each subswarms triggers a bigger swarm on the next pancake fault suggests that there is a fair amount of stress in the system. To me this looks more like a rifting fissure event than a swarm leading up to a large earthquake. We have two examples where activity like this has been seen in Iceland. The first one where we had independent fissures rifting was obviously Surtsey, and the other was Krafla Fires. But to date there is no known instance in Iceland where a prolonged swarm has induced a large tectonic earthquake. Yes there can be a first for everything, but this still looks like an “ordinary” rifting event that may, or may not, squirt a bit of lava in the end. New IMO statement says swarm still only tectonic…. IMO will probably wait till its more than a interesting scientific possibility. For them to declare its volcanic has a lot larger implications than when a site on the internet does it afteral. The Sinabung eruption this morning was a big one. Several evacuated villages were reached by the pyroclastic ash, which shows that the authorities were well prepared. They reached 5 kilometer in one direction. Ash badly affected some villages outside the zone. Air space near the volcano, and one airport, has been closed and flights crossing Indonesia are being redirected – a bit. Nothing out of range of previous events here, but impressive nonetheless. Would Sinabung be high enough and sulfur laden enough to have an effect globally? It’s fairly close to the equator. I think Carl predicted that the 50K ft high Bezymianni eruption on 20 December would have an effect in February. Any chance that the Sudden Stratosphere Warming that disrupted the polar vortex can be linked to the December eruption? Not that we in the Mid Atlantic seaboard have anything to worry about. Most of the extreme weather is missing us this year. I think Lurk in the Florida panhandle has had more snow that the Baltimore-Washington corridor. An interesting supposition MidAtlantic! It is still not clear what effect that SSW will have where I live in the UK but severe cold is possible from the end of February at least. I hadn’t personally thought about a link between the December eruption and the recent SSW so I would be as interested as you to get an answer to the question you posed. This eruption from Sinabung is far too small for an effect on climate or even on the weather. The current SSW event is not that unusual (it happens every few years) and it seems to proceed as expected, with a huge Siberian high pressure system developing. I strongly doubt any volcanic connection. Europe should have a week or two of nice and dry winter weather, but nothing extreme. Now, in my opinion Sinabung is the most likely candidate worldwide for a significant eruption, because it combines the danger signs: long period of quiescence followed by continuous but minor activity, big mountain, and an area that has a track record. ‘Most likely’ means ‘very small chance’ so don’t take this the wrong way. But if you want see what a VEI7 precursor might look like, look no further. Hi! This last eruption of Mt Sinabung was what VEI? Thank’s! The North American half of the SSW/PV disruption is not behaving as in the past. Usually, the east coast gets the bulk of the cold air/troughing, but this time the trough is setting up over/west of the west coast. Part of the issue is the MJO, which has been parked in ph7-8, which has altered the position of the NPac high pressure, along with a prolonged easterly flow that’s helping retrograde the high to the NW. This morning here in California, we set several low temp records (for the date), and long range is showing the general cold trend will continue. Whether this unusual SSW/PV setup is due to volcanic aerosols is anybody’s guess, but I thought you’d be interested in that the PV disruption is not of the “regular” variety out here. right now the temperature is the same in Boston and Los Angeles. Haven’t had a chance to run the numbers for potential tropopause crossing, but in the tropics the tropopause is quite high. At Bezymianny the tropopause is much lower and easier to cross for any given eruption. How all this interacts with the ongoing sudden stratospheric warming phenomenon is beyond me. (Enso, NAO related). Last I read, the SSW has the effect of splitting the polar vortex into two nodes. In a way, this is interesting. In large mode shifts, Florida tends to warm and Europe freezes. It’s something I need to go back and read up on since I’m not real clear on the actual tendencies. I think it depends on where the split vortex moves to! But it is typical that when Western Europe shivers under a winter north-easter, the US east coast is balmy. I don’t know about California! That is a whole different world. I hope it gets some rain – that might come in handy. The weather there might be more related to the tail of the La Nina. California native here. Cold, dry winters are very typical for a La Nina year. I am a native northern Californian and weather buff (to the max), and what we’ve been experiencing this year is unprecedented in scope of the re-developing drought and the almost total absence of any storms. Usually we’re cold and wet in NorCal during La Nina, but we’re warm and bone dry up here as well…and well on our way to resuming the over 10 years of below normal precip (excluding 2010 and last year’s bounty in the north and central areas). This year, SoCal was an inferno in the heart of the rainy season. Now, suddenly after many years, and seemingly out of the blue, the SSW/PV disruption and now we’re colder than it’s been in many years. That we’re seeing a general retrograding pattern so late in the season is further evidence of how strong the PV/tropospheric coupling is and the direct influence it’s having on our sensible weather. BTW, there is a chance of sea-level snow at times over the next two weeks). LoL. California can get much much worse if hydrological history has anything to say about it. If I remember correctly, at one time there was a 400 year drought in the distant past. 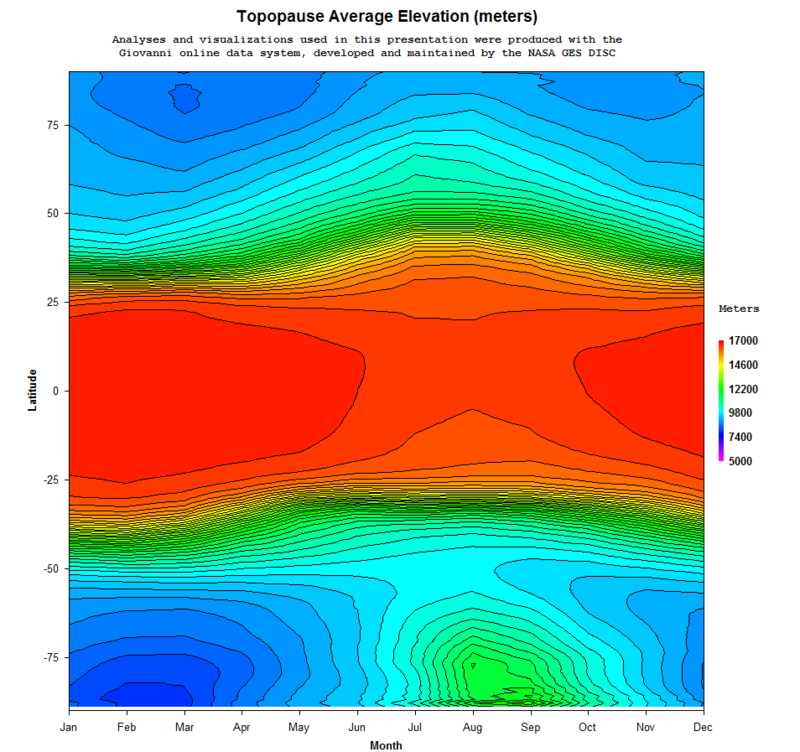 Interesting about the height of the tropopause. Any idea how much higher it averages in the tropics? The reported heights of the Sinabung eruption were a bit strange. The Japan VO had the height initially at FL500 (~10 miles), then revised down to FL240. The Darwin Ash Advisory reported two clouds, the Northern drifting cloud they put at FL450 (~9 miles) and the cloud to the East was at FL140 (>3 miles). They also expected the cloud to dissipate by 6 hour mark. I figured it could not have been too cataclysmic with that dissipation rate; however, the before and after photos of the crater rim are impressive. Incidentally, I’m just really geeking out at having a conversation about MJO, ENSO, NAO with people who don’t need to expand the acronyms. Now that’s talking about the weather. I’m also a big fan of the cosmic rays seeding clouds theory and how that will work out with a Grand Minimum. We may be living in interesting times. Remember, with chaotic, emergent behavior, just don’t fall too much in love with a single theory. I can’t give you a definite answer for the height. It changes with the weather and the season. I have long forgotten the nuances of navigating the Giovani website, but this is a grab of some data back when I was (sort of) studying it. Click image for full size. I have to disappoint you on the cosmic seeding and grand minimum. When I looked at the numbers, I came back fully unconvinced. The evidence that solar inactivity = cold weather is not statistically significant (it dates from a time when the little ice age was thought to be a brief event, while we now know it lasted, on and off, for 500 years) , and the physics behind cosmic ray cloud seeing is more than a little dubious. Thanks Geo. So it looks like Bezymianny only need to cross FL320 (~6,2 miles) while Sinabung and other equatorial volcanos need to exceed FL540 (~10.5 miles) to see an effect in the stratosphere. The upper estimates of column height were closer than any has reached in many years, but not quite there. I’m cool, Albert, fortunately the next five to ten years of data should give us better answers on the effects of Solar Minimum on clouds. I just like new, contrary, and strange information, like the theory that soil bacteria in clouds changes the temperatures for freezing and saturation. Reality is constantly exceeding our imagination and theories. The nitrogen was in the molecule that form aerosols. They used C2H7N (I think) – the ‘N’ turned out to be important-just ammonia wouldn’t do. They also found that cosmic rays did nothing much. As for Albert shooting holes in the grande minimum idea, he’s correct. I’m a pretty strong believer in the idea, but I have to concider it as being my own moon-bat tendency. The emperical data just isn’t there. Knowing my own logical failing, my current running idea is that there needs to be a concurrent low solar state along with some energetic volcano activity. Ya see, there is also some doubt that a singular volcano can do it alone. 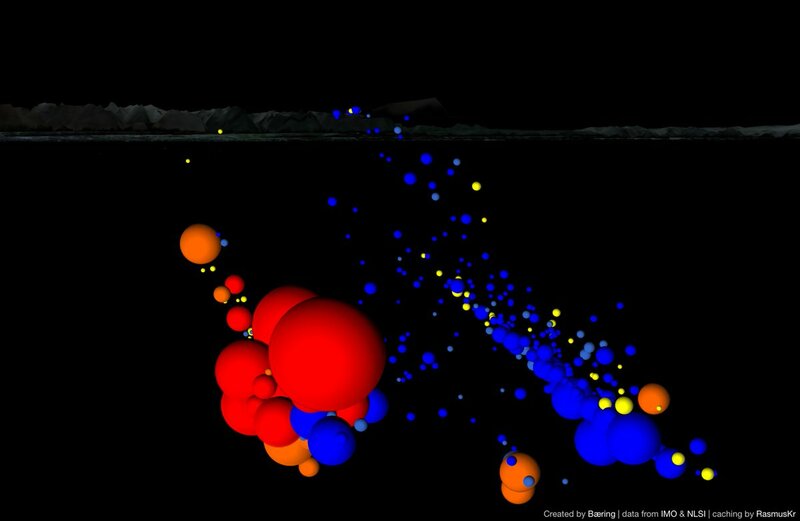 Multiple energetic volcanoes or a honking huge one… maybe. In my line of Web spelunking, I run across some discussions by solar astrophysicists, they are generally of the idea that there are no tangible indications that we are entering a grande minimum. Some time back, I ran a curve fitting routine against the official SSN record and noted some oddity with up coming activity, but the thing about curve fits, they are only authoritative for the period of the data that they are modeled for. Their predictive ability goes to ZILCH outside that data range. In fact, some functions have a native tendency that will dominate how they behave outside of their fitted range. Polynomial functions are well known to do this. Side note; I have subsequently found that the “official” SSN count that I used is quite inaccurate. (but, it was the official record at the time I was looking at it) It shows massive bias dependent on who was actually doing the counting. A Sunspot Working group was formed to go through the SSN record and group count data to resolve the discrepancies. Some of the details of that can be found here. A longer stretch on one of those faults is responding. I think you can’t get rifting on a series of parallel faults (the rift would be divided over the faults) but this looks like a single fault. The trouble with that map is that there’s too much noise. Far too many misplaced quakes. Note that in the IMO map grey outlines means not checked. Black outline means checked. Not a single one of the circles (not obscured by stars) in this picture is verified. Some of the stars also have grey outlines and need checking. You are right. I have assumed that the M3+ would be well located even if not yet checked. That may not be true – let’s see how they change when checked. I think it also has to do with being over 50 km away from the main land, having less equipment close by, plus the rather intricate structure of the soil with several layers and faultlines, and being spread over two continents – all of which is making measuring more complicated? I made various sequences from the earthquake data. What do you by this Carl? Couldn’t understand what you meant. And is there really a caldera down there? – I am going to be the sceptical here. The Tjornes region runs SE towards NW, its orientation is against rifting faulting or a rifting event. I think this is a fracture region and perhaps a Surtsey eruption could start. But a Krafla-style rifting eruption is rather unlikely. Even a Surtsey is unlikely. A submarine one is more possible I think. Now this triggering Theistareykjarbunga a few years down the road, is a more likely scenario. The 76 quake in Tjornes happened at same time as Krafla started its rifting. Maybe if theistareykjarbunga gets activated by this event (probably indirectly) then it could be the ‘other’ big lava flow of this hotspot maximum. And unlike holuhraun it would happen near the coast, sort of, and so lava could flow into the ocean in a place that is not in the middle of nowhere. By the looks of things from GVP it also might be relatively long lasting too, a few years or so. Is theistareykjarbunga still undergoing inflation like it was when the old 2011 article was written? If it is, or was until the last year or two, then this could be something to watch closely in the next years / decades. Please could someone explain what this graph means is the energy (red) from earthquakes or wind or wave or weather related. Bang! And the dome is gone! Kondisi puncak Gunung Sinabung, sebelum (atas) dan sesudah (bawah) erupsi 19 Feb 2018. Kubah lava di puncak betul-betul dimusnahkan. Should we imagine the Vesuvius eruption the did for Pompeii and Herculaneum to be of this magnitude? Since what year the lavadome was sitting there? Last year. Several domes have formed and collapsed since the startcof the eruption. It is a bit remarkable. I will just state that I am on the side of ISOR on this one. This is a rootfilling event. But, more to come in the next article. Is it known what the locking depth is in this area? Unlike the Husavik-Flatöy Fault that is a strike-slip with dextral spread, this is a bookshelf fracture zone without strike slip function, so any locking depth would be dependant on local fracture factors for each single fracture. One could even argue that there is no locking function at all, and that hindering factor for an earthquake is the cohesiveness of the crust at point of initial fracture. That being said, the main bulk of energy release has been at around 12 km depth, so maximum strain should have been there. With a spreading/rifting episode like this. Should we expect stress/tensions to be transferred to nearby faults? Most likely. It may or may not trigger more earthquakes. The speed of stress propagation is rather slow, in the order of several days. The two large earthquakes in the SISZ in the year 2000 were separated in time by four days, just to give an example. Yes in a bookshelf or transform fault (as in the SISZ). But in a straight spreading ridge the transfer of stress is less, I think. I just saw on the news the discovery of 3 new minerals on Fogo volcano area in São Miguel Azores. This discovery was made by italian geologists. This is very interesting and show the importance of this volcano to science. Fogoite is the name of one of this new minerals. Side note for all regarding the main post topic. Nearly ALL of the seafloor is made up of Gabro and Sheet dikes. The difference in Iceland, is that we have a more close up view of the process. Here’s a video of Sinabung taken by Billy Barus. On his phone you get the feel of how huge it got. What VEI could it be? 2-3? This blast probably just about got to VEI 3, though it was VEI 4 intensity (if it had continued for 90 minutes instead of 10 it would have got to 4), but the Sinabung eruption (since 2013) overall is at VEI 3 already anyway. Some of the checked quakes of the Grimsey Swarm are now coming up more shallow.. Would be interesting to see an updated plot… Still no increase in low frequency tremor signal. While TFZ has been active, Vatnajokull, Myrdalsjokull and friends have been very quiet. All the green stars just went away. Did someone reassess the M of all the TFZ quakes? I think the last M3+ just dropped out from the 48h window. That would do it. I was busy wondering if the lack of sensors for quantifying depth resulted in a reassessment of the magnitude. All I really needed to do was pay attention to the time plot below. Sigh. Sometimes you have to be really clever to make a simple mistake. And now the activity seems to resume. A lot closer to land this time. And a M3.2 in south Iceland, SISZ fracture zone, near Hengil. This one is probably not correct. There is no matching waveform in any of the drums and it is not drawn as a star on the map. It was removed while I posted. Wonder if these new stars and activity are caused by stress transfer from the events north east of Grimsey? Easy to see a link for the Kopasker star. Not so for the one in th south..
Also no geoscientist here. But these episodes with activity over very large distances are intriguing. I do not think there are any solid explanations. From WAY up the thread….. Dear Lurk, i actually googled “moon-bat” and according to Wiki etc “moon-bat” is one word… “moonbat” and that is the entire addition i can add to the conversation…. 😉 Best!moonbat motsfo is watching the curling finals…. I’m a redneck. If I deviate from “accepted” grammatical conventions, it’s because I am obstinate and don’t really put a lot of stock in the “accepted” way of doing things. As a representative of both Hatfield and McCoys-I resemble that remark, too.. Roughly 150 years ago, half of my mom’s family tried to kill off the other half. Seems they didn’t like the side with a Choctaw grandmother. On my mom’s side, my family has been in MS since around 1790. I know because an ancestor won a court case in Nachez and got “10 gallons of good whiskey and 4 horses” as renumeration. The quality to be determined by court appt representative. Not only volcanic, but the meanest nastiest type. Granite is rhyolite that never got blasted into the air. That also means that the stones probably emit radon from radioactive decay. I wonder if the radioactive decay provides sufficient heat to reduce friction? Depending on the age of the rock, you might be able to engineer stones with greater or lesser drag. Wow, geology could add a whole new level of strategy to the game and you could add geiger counters to the brooms as standard equipment. You need a fair (probably wrong word) amount of radioactivity to heat rock. A better way to reduce friction is by increasing pressure: put the granite on skates. That may not be legal in the sport though. We have a big slab of it here in Devon which manifests as the weather resistant mass and outcrops Dartmoor, Bodmin moor and Lundy Island (different age). I did my geography coursework at college on radon gas and its impact on those that live there. That is indeed so, in many cases. Some of the mountains around Bergen, Norway, such as Løvstakken, a granitic massif on the city’s Western side has fairly significant radon production. And apparently the ground is a lot hotter than normal as a result of the radioactive decay. You don’t need to heat the rock much and think of all the lead lined accessories could be added for both the players and the audience. As for curling, I think they would have a larger audience if they were riding those stones down the super G course. I sure would be interested to see that. Otherwise sports on TV fail to get my interest.. It has to be live! I did appreciate the female Super G. It was won by a snowboarder who ran the course on borrowed skis. At the end, she was flommoxed as to why everyone was cheering. Nick Goepper, who lives not to far from me, got a bronze medal in 2014 Olympic Slopestyle. 3 Golds and 2 Silvers in previous Winter X games. 1 Bronze in the FIS Freestyle World Ski Championships. In this 2018 Olympics he’s won the Silver in Slopestyle. So we’re proud of his accomplishments around here. That look on her face was truly priceless. Activity at Iceland has increased earthquakes between every 1 – 4 minutes since midnight and one green star. Here is a video of the start of the Sinabung eruption. 7.2 in PNG. Guess the area is going to be sparsely populated, hope those nearby are ok. Looking at google maps it’s centred not too far north of Mt Bosavi, an extinct volcano which featured in the nature doc Lost Land of the Volcano. I do wonder the confidence level of the term extinct in a place like that where the jungle would cover up everything pretty quickly and I would imagine it is a pretty hard place for scientists to do any extensive studies. Also some 50 km to the north east are the Doma Peaks. Major earth quake. M7.5, in western Papua New Guinea highlands around 1740 UTC and 0230 local time. Fortunately the epicenter looks to be far away from large population centers and it’s too far inland to be a major tsunami risk. 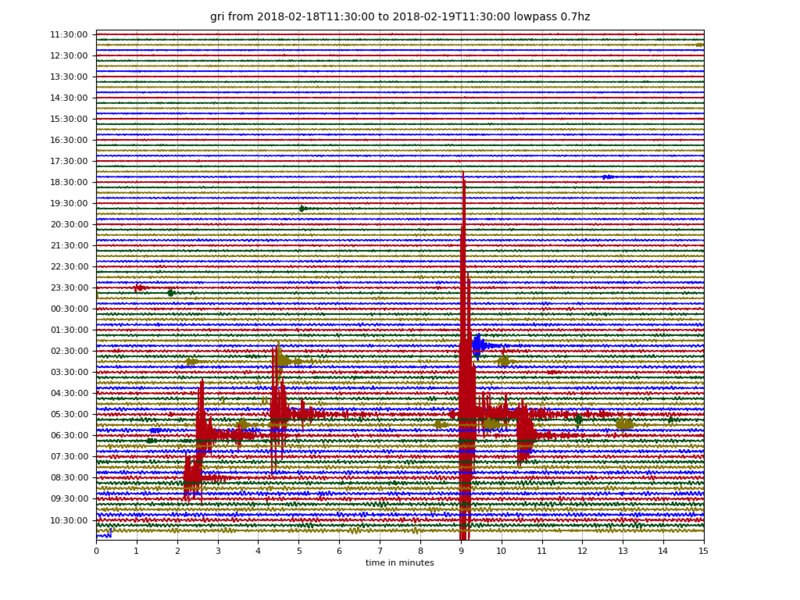 You can see the shaking lasting well over 5 minutes on the Indonesian volcano seismographs. Anyone know if there is an seismographic data on Kadovar? Kadovar is about 300KM from the epicenter. I curious whether this had any effect of the eruption. According to the map, the epicentre is near a gas processing plant. No reports of damage so far according to Earthquake Report (they were appealing for information earlier the evening). Silence probably reflects that the epicentre is in a remote area, rather than no damage. USGS is expecting fatalities and damage. I looked up the area and close by is Iagifo Camp, a mining centre. Piping is run above ground due to frequent seismic activity. A lot of Aussies and locals work there. Hope they are OK. It’s very remote for sure but there is a local aerodrome. Exxon have shut down the processing plan and plans to evacuate it. The local airport, Komo, is closed at the moment. Some fatalities (10?) but could be more when the damage has been assessed. Shallow 7.anything is no joke…. i actually hurt my back in one… here let me shake You at a shallow 7… 😉 Best!from motsfo looking at new snow…. No thank you very much, just got a Tetanus shot and it hurts enough! Aftershocks are very interesting….. they seem to run right down the mountain range. ELI5: What do those “beachballs” show? I read over an article, found here, on them but I didn’t get it. Are they magma related? In this case it says the earthquake took place on a thrust fault (compressional). The beach ball also gives the orientation of the fault (WNW-ESE) and two candidates for the angle of the dip. For thrust faults it is usually the most shallow dip that’s the correct one. New post is up! A dissection of the Maya empire.